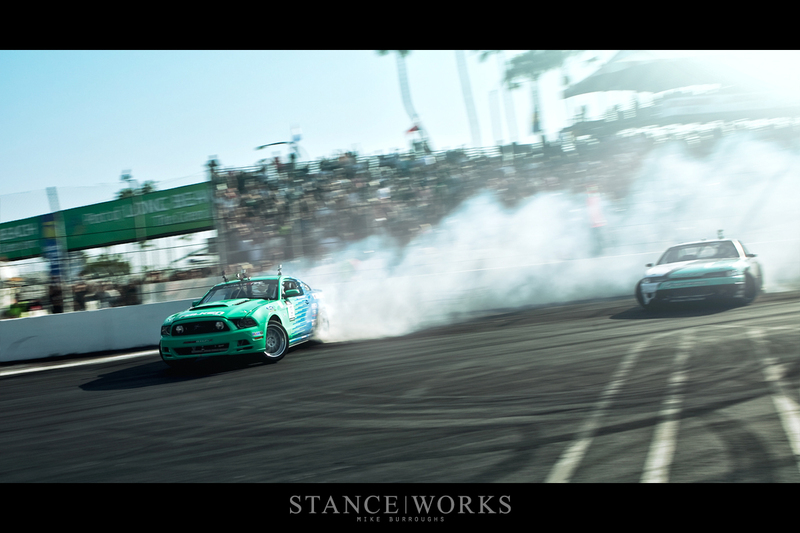 Round One of Formula Drift has concluded, but the scent of rubber lingers. The streets of Long Beach, California are scarred and tattered, ripped to shreds by the screaming tires of today's top 16, and the smoke was never given a chance to dissipate as today's drivers battled it out for the first podium of the series. Cars smashed and bashed their way through the afternoon, and the podium was met with both familiar and new faces. The day began with an open practice session for the top 32 drivers. It was a final chance for the teams to work out any kinks before it was game time. Most of the cars practiced in tandem to ensure they were prepped for race day, with several close calls occurring before there was even a need. 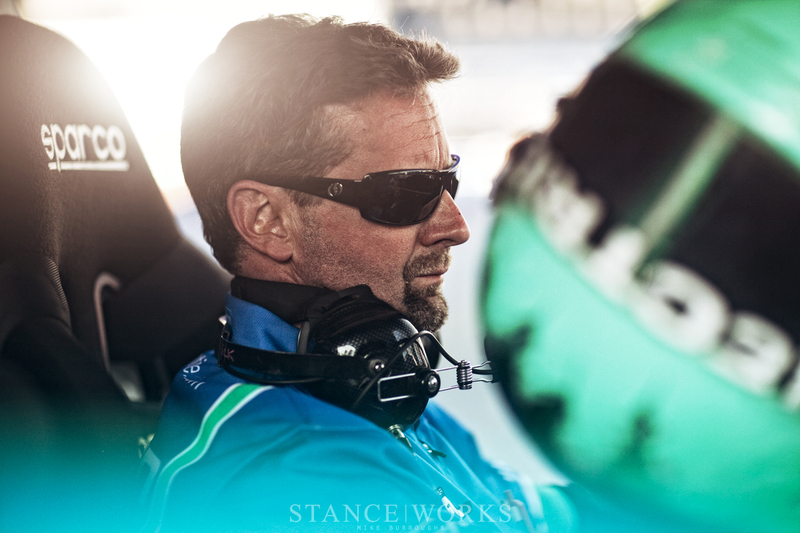 The tension was on a constant rise with each driver pushing to establish even a thread of dominance over the other drivers for that slight edge in competition. 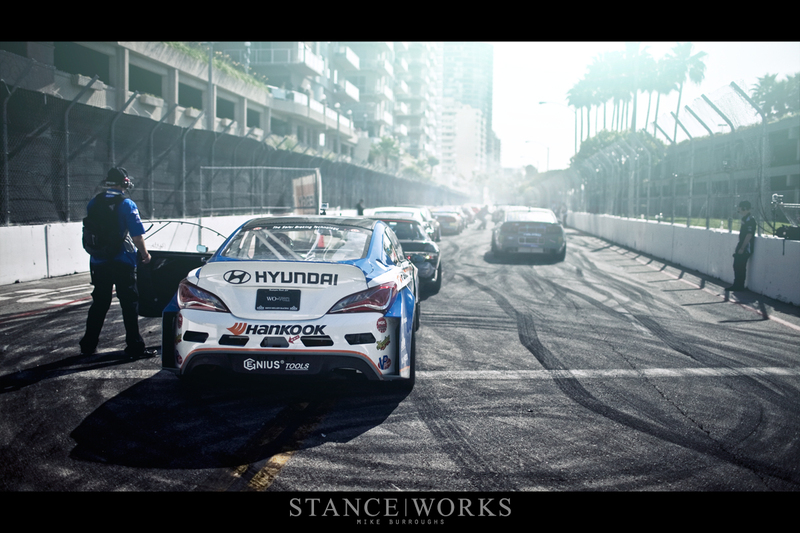 The cars were pushing hard and the day had only just begun. After the morning's practice session, the discovered kinks needed to be corrected so that each car was at its peak of competitiveness. The teams hudled under their awnings and trailers attempting to dial in what was needed for the race. Cars were patched back together, ziptied and taped to oblivion; each car must be presentable for competition. 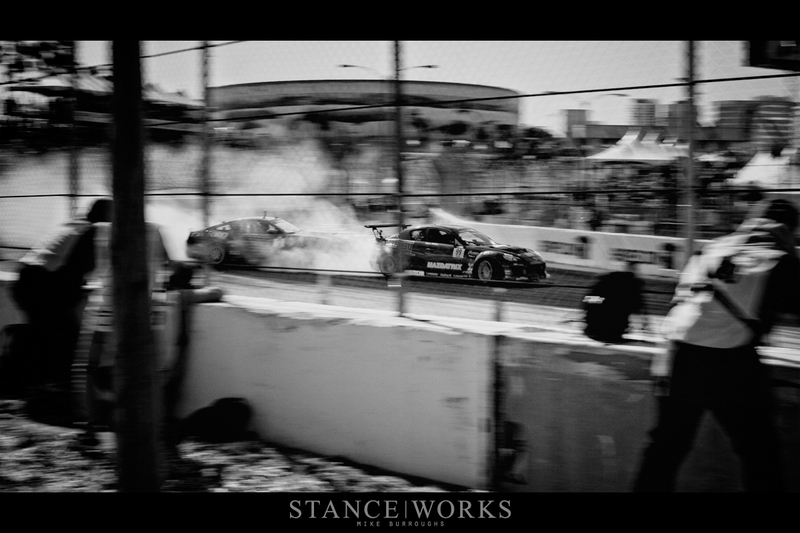 The scars from tire walls and k-rails serve as a constant reminder as to just how close these drivers were pushing to the limit. There's a brief moment of silence before the cars head back out to the track. Only the rustle of the crowd and spectators could be heard. The whine of air tools ceased and the clicking of ratchets at faded. 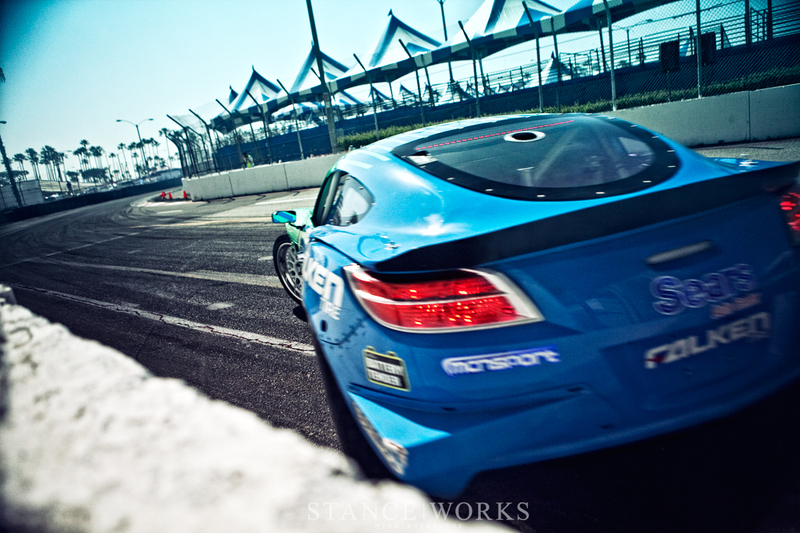 The drivers prepared to give it their all; their driving now mattered more than ever. The silence was short lived. 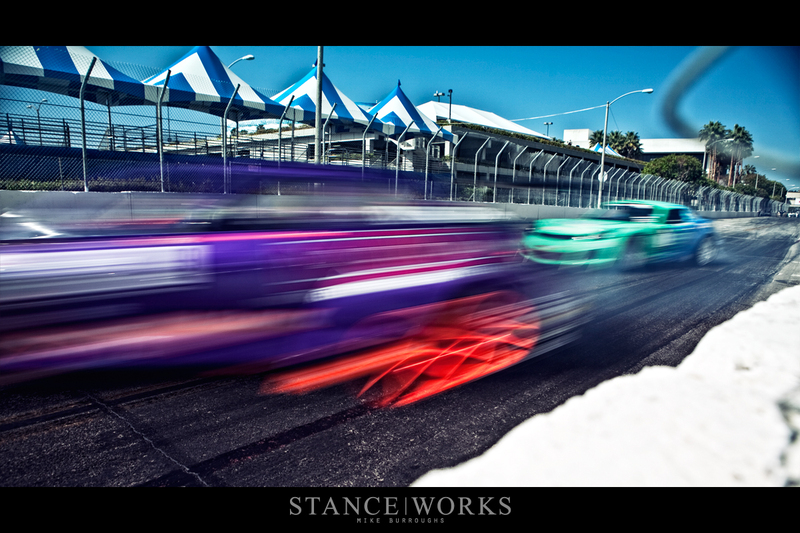 The sounds of 3-dozen race cars screamed to life at once. It was time for the Top 32 Knockout. Each of the drivers were paired off and went head to head in a two-round elimination. Each car was given a lead run and a chase run, and if you're new to the series, it's rather simple. In the lead position, the driver executes the proper drifting line through the course, hits the clipping points, maximizes speed and angle, and goes for as much style as possible. In the chase position, however, it's the driver's task to mimic the lead car's line exactly. If the lead car takes a poor line, so does the chaser. And oh what a chase was given. The day kicked off with a number of wall taps, each ending in a car needing to be towed off track after a collision with the next wall. 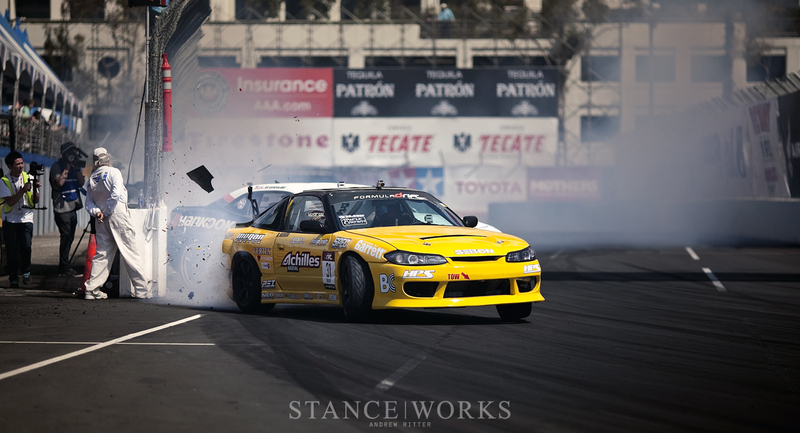 The first to go was the Achilles S13.5 after making contact with the wall after the transition for turn two. It was this exact spot that claimed a hand full of cars throughout the day. Of course, Bil (dubbed "Santa") manned the corner and rarely flinched at the explosive debris of plastic and fiberglass that flew towards his face. The drivers and cars were knocked out one-by-one with love-taps and hate-punches being delivered in each round. V8s were pitted against their rotary or turbocharged counterparts on more than one occasion, giving the crowds sides to cheer over. The rotaries screamed past, backfiring and popping with the sounds similar to a hail of gunfire while the V8 monsters shook the earth as they roared past. The sounds were often the only thing distinguishing the cars which were lost in the haze of smoke. When only 16 drivers remained, the cars were lined up on track. Each driver was given an introduction at which point they were both cheered on by their fans and surrounded by photographers. While some drivers seemed calm and ready for the challenge ahead, others did their best to rile up the crowd and gain the support of everyone who showed up. The fans' roars drowned out anything the drivers were yelling. The announcer made is way down from one driver to the next. 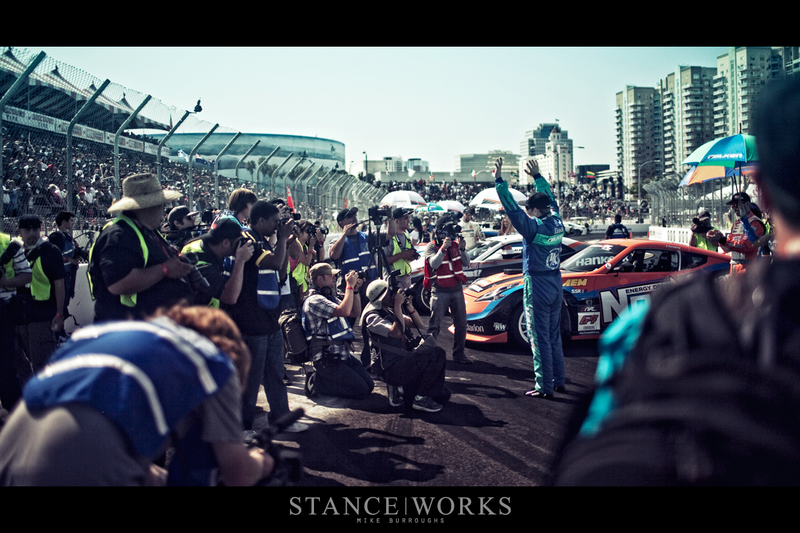 Powers took the honor of climbing the fence, taking the crowd from loud to deafening, only to be one-upped by the cars coming back to life and making their way to the starting grid. 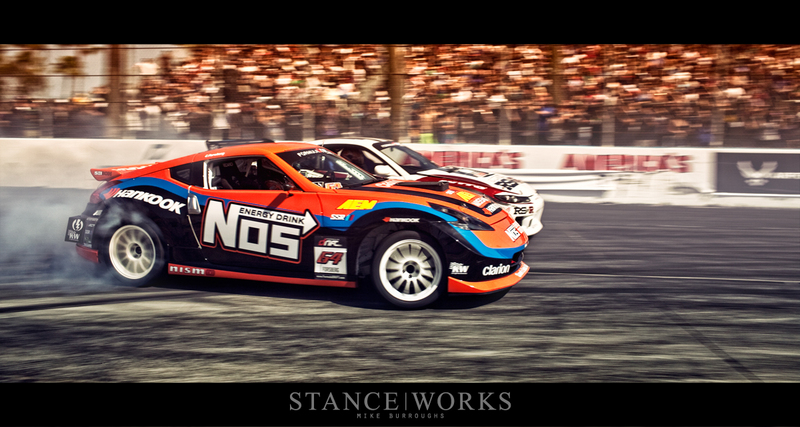 The top 16 hit the track, and first up was Ryan Tuerck, yesterday's #1 qualifier, who went head-to-head with Powers. Tuerck was knocked out not by fault but by judge's call, a tough call for any driver to face. Chris Forsberg and Toshiki Yoshioka went head to head in a round so close that the crowd cheered endlessly. "One More Time!" The gaps between wall and car narrowed as the competition grew stiffer. 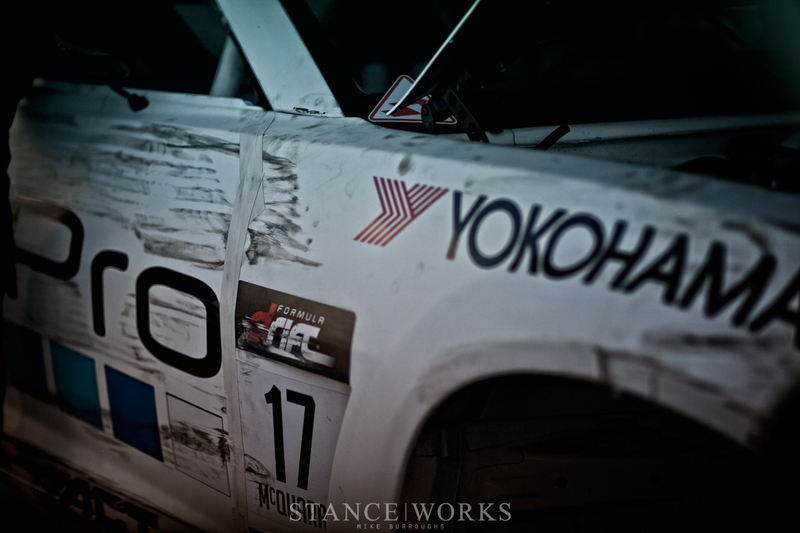 Rear bumpers tore the adhesive banners from the concrete k-rails and spoilers got caught in the chain link fencing. As the cars dropped off, the remaining few seemed to sprout GoPro cameras as every videographer wanted to get "the final shot." The best photo spots became crowded as every photographer was desperate to capture the deciding run. The knockouts continued until the final four remained. Justin Pawlak conquered all for a return win in Round 1 of Formula D. The Formula Drift carbon fiber trophies were awarded to the podium finishers just as the sun began to set. 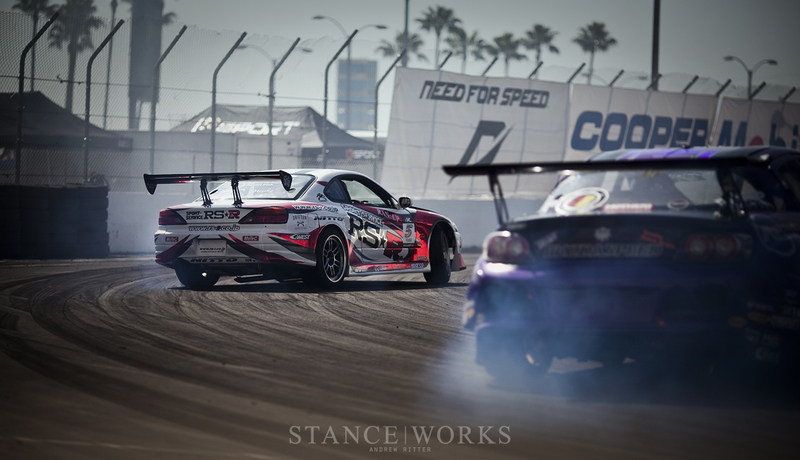 Daigo Saito took third place, a solid finish for his first FD event. Daijiro Yoshihara took second for a solid return from his overall win last year. Just a few weeks away is Round 2 at Road Atlanta, known for being the best event of the series. For everyone in the South East, this is the event to attend. Keep an eye out: perhaps we'll see you there.